The Son of Man came for one reason, “to seek and to save the lost.” Jesus made this point in Luke 19. This chapter describes Jesus as He visits two towns and the Temple. First, Jesus stopped in Jericho. This city stands out on the pages of Jewish history. Joshua led Israel across the Jordan River into the Promised Land and Jericho represented Israel’s first conquest in Canaan. It was momentous victory orchestrated by the hand of the Lord. Jericho was a walled city, but those defenses would fall flat as Joshua and the people obeyed the word of the Lord. Nearly everything and everyone in the town was destroyed, according to the instruction of God. What exactly survived this attack? A Babylonian cloak, a bit of silver and a brick of gold – all of which were snatched away by a disobedient soldier named Achan. He hid them in his tent, but his sin was found out. He brought defeat and death to Israel and also to himself and to his family with this foolish act. That’s the sad part of this Jericho visitation of the Lord. The glad part of that first visitation involved a harlot, Rahab, and her family. She believed what she had heard about the God of Israel and the power He demonstrated on behalf of His people. She hid two Hebrew spies and was rewarded with a promise of safety for all who would be found under her roof. God proved faithful to Rahab. She and her family were spared from the ruination of Jericho. Beyond this, Rahab was taken as a wife by one from the tribe of Judah and she wound up in the family lineage of King Jesus. What a great salvation was given to this woman. In Luke’s gospel, we read of how Jesus comes to Jericho and meets someone else seeking God. 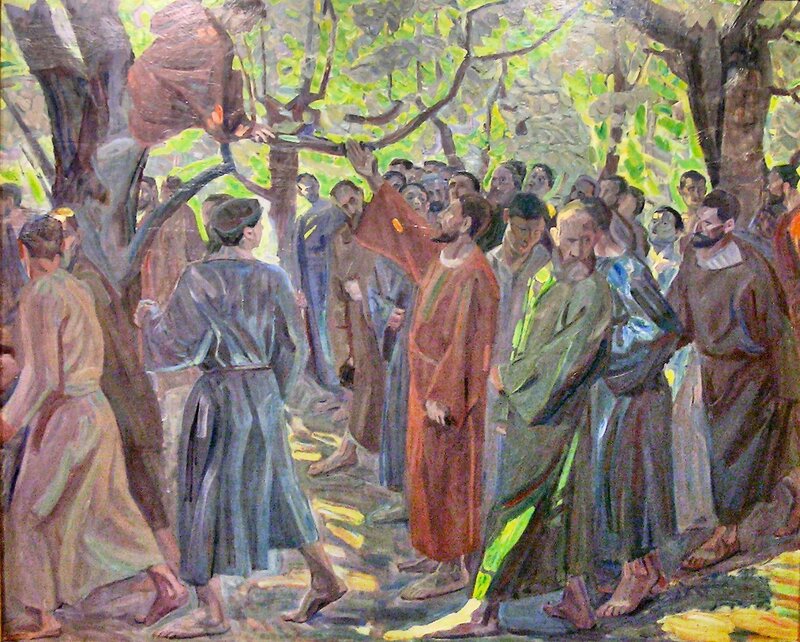 Zacchaeus was counted as an enemy of his people. This Jewish tax collector compromised with the Roman Empire and was known to overcharge and cheat those from his own nation. On this day, however, everything changed for Zacchaeus. He wanted to catch a glimpse of Jesus, but he was too short to get a view of the street. So he climbed a tree and caught the eye of his Savior. What Zacchaeus didn’t know was that Jesus was looking for him, too. And once the Lord saw him He invited Himself to have lunch at the tax collector’s house. It struck many there as odd and disgraceful that Jesus decided to eat with this crooked man. The presence of the Lord filled that place and Zacchaeus was transformed. Like Abraham, he believed God and it was counted to him as righteousness. Salvation entered a Jericho home through an open door and found an open heart. It was a triumph and a joy to Jesus. After this remarkable moment, Jesus moved toward the larger and more significant city in the region, Jerusalem. The news of His coming had surely been heard. How would He be received? Would there be those, like Zacchaeus, climbing trees to get a look at Him? As He drew close to the city, a crowd shouted, “Hosanna! Blessed is He who comes in the name of the Lord.” Their expectation, however, was different from that of Zacchaeus and Jesus knew it. These people wanted a conqueror, a hero, a champion who would push back the forces of Rome and raise Israel to the heights it once had during the days of Solomon. They wanted a king made for this world. Jesus was King, but a King of another kind; He was and is a King who came to win hearts for the Kingdom to come. Jerusalem was a place of cold, hard religion. The understanding of this broke the heart of her true King as He surveyed the city from a hilltop. Jesus wept. He knew the rejection that was to come. He wept not out pity for Himself, but out of grief for what that rejection would mean for His Chosen People. On that day, the very peace of God was there for Jerusalem. The leaders and officials of the town had crafted many rules and negotiated with Rome to contrive a measure of tranquility in Judea. But such things were not able to bring the lasting peace that Person of the Son could offer them. Jesus came to His own, to His nation, to His brothers and sisters, and they did not receive Him. They shut their eyes tight and plugged their ears to the message of salvation that Christ came to deliver. Did Jesus turn away? No, He did not. Jesus put Himself right in the center of Jerusalem life. He entered the Temple and exercised His authority. Here, the Son of God took His stand. He drove out the merchants who had made the House of Prayer into a den of thieves. These wheelers and dealers masked the glory of God and stole from the people the sense of His presence that should have reigned in His House. The authorities sought to destroy Jesus. And, they would do just that in time. Their loud voices and bullying ways would send Jesus to the Cross. But for now there was nothing these leaders could do. Peace had come. The visitation of the Son would accomplish its work in those willing to hear and believe. And so Jesus taught daily. The Rahabs and Zacchaeuses came out to hear Him. Such as these hung on His words for they found them to be words of life, words of salvation and hope.